We are Manufactures & Wholesales of Online Store of Printed Sarees & Bollywood Designer Sarees. 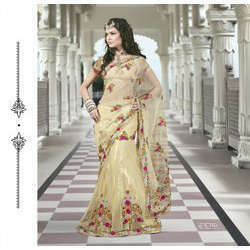 We are offering our client an excellent quality range of Cream Colour Designer Sarees. These Designer Sarees are available in various unique prints, they are also soft and comfortable to wear and can easily lure anyone. The superb color combination of these Indian Designer Sarees enhances the look and the charm of wearer. We are highly praised for the intricate design and light weight of these Indian Designer Sarees. Our patrons highly praise our collection for its fabulous attributes like contemporary styles, colour-fastness and light weight. We offer an elegant blend of class & style, in our range of Red Designer Work Sarees. These sarees are in wide demand in the market due to their excellent quality of fabric, flawless workmanship and tempting designs. We are highly praised for the intricate design and light weight of these Indian Designer Sarees.Our patrons highly praise our collection for its fabulous attributes like contemporary styles, colorfastness and light weight. Our clients can procured from us a classy range of Ladies Yellow Designer Sarees. This array of sarees is procured from the certified vendors of the market who make use of graded yarns and advanced machinery that ensure its clean finish and superior quality. Our patrons highly praise our collection for its fabulous attributes like contemporary styles, colour fastness and light weight. This bollywood Designer saree are mainly the job work based Charming Stone Work Designer Sarees as it required a concentrated work. We have good name in an Indian and international market for its quality products. The demand of offered designer sarees is increasing among patrons as these are designed as per the latest trends of the industry. Our patrons highly praise our collection for its fabulous attributes like contemporary styles, colorfastness and light weight. We are offering an attractive and Stylish Indian Designer Sarees. We offer a wide collection of Party Wear Designer Sarees. This pretty piece that has majestic motifs and eye catchy color combination.Our patrons highly praise our collection for its fabulous attributes like contemporary styles, colorfastness and light weight. We offer a wide range of beautiful Majenta Embroidered Designer Sarees sarees, which come in vibrant colours, varied sizes, designs and patterns.These provide a great comfort to the wearer and are available in market in various designs and patterns. These are highly demanded in the market due to their attractive patterns and designs. We offer an exclusive range of Art Silk Designer Sarees with fine finishes. These designer sarees are crafted using latest fashion, enchanting designs and vibrant color choices to meet the complete demands of our clients. we are instrumental in offering Ethnic Designer Fashionable Sarees, Party wear Saree. The offered saree is fabricated with the help of supreme quality fabric and cutting-edge technology in compliance. We offer this saree in a number of patterns, designs and shades as per the specifications laid down by our clients. It is highly demanded by our clients due to its flawless finishing and tear resistivity. Avail from us an alluring collection of Indian Bollywood Designer Sarees and Fancy Party Wear Sarees, which is designed by a pool of adept designers. These sarees are completely printed using advanced techniques and software, ensuring proper symmetry in the printed patterns. We feel privileged to present an exclusive collection of marvelously designed Fancy Indian Bollywood Designer Sarees and Wedding Sarees at industry leading prices. These wedding sarees are unique due to enthralling designs and patterns.Keeping hold of best designers across the nation we have marked our company as the leading manufacturer of Designer Saree. Bollywood Designer Party Wear SariWe are one of the leading manufacturer, supplier, and exporter of wide range of a Bollywood Designer Party Wear Saree. Outstanding dark violet saree is invented on net with glowing sequins work and embroidered patch border. Magical body is festooned with sparkling sequins, stones, resham embroidered floral creeper motifs and scattered green color patch are very well done on it. This timeless beauty will surely be the talk of town. We are one of the leading manufacturer, supplier, and exporter of wide range of a Chiffon sarees . Chiffon saree is nicely designed with resham, Embroidered patch boota in form of floral motif is making this saree look more lovely..We offer our clients an impressive collection of ladies bring out the feminine appeal of the woman. This soft saree has colorful designs canring it. Furthermore, our clients can avail these beautifully designed sarees at industry leading rates. We are one of the leading manufacturer, supplier, and exporter of wide range of a Indian georgette designer saris. The gorgeous Crean color pure georgette sari is designed with lovely red floral and discharge print and blue border. Georgette Saris are manufactured using outstanding quality raw material, which is procured from the most reliable vendors of the market. We are one of the leading manufacturer, supplier, and exporter of wide range of a Traditional Bollywood Fashion Net Saree. Customers can avail from us an exquisite collection of Bollywood Net Sarees at the most affordable prices. These are designed specifically as per the fashion that prevails in Bollywood and TV serials. Our sarees are enticing as these glorify the look of the wearer. Moreover, these can be worn on occasions like parties, social get together, marriages and many more. Outfit is an expression of good taste and personal style. Astonishing dark maroon color net saree with shimmer georgette patch makes sure that the most special day of your life remains memorable. All over scattered floral motifs will give this a true beauty. Exclusive look patch border is adorning its beauty with grace. Outfit is an expression of good taste and personal style. We are one of the leading manufacturer, supplier, and exporter of wide range of a Designer Bollywood Fancy Indian Wedding Sarees. Spectacular dark violet and megenta color saree is invented on net with glowing sequins work and embroidered patch border. hese are extremely comfortable to wear and are available in attractive designs, color combination, patterns and finish with outstanding embellishments. This timeless beauty will surely be the talk of town. Looking for “Printed & Designer Bollywood Sarees”?